This is a classic, and Lima's quintessential breakfast sandwich. Slices of chicharron -boiled and browned pork (think Mexican carnitas without the Coca Cola) are joined in a crusty french roll by salsa criolla (thin-sliced red onions, in lime juice, with a bit of aji), and a slice or two of fried sweet potato. It can't be beat. Another breakfast classic, salchicha huachana -a style of mild sausage somewhat reminiscent of Mexican-style chorizo, spiced with aji panca, black pepper, cumin, and a few other spices, originally from the town of Huacho- stuffed into bread, either with egg, or -as in the photo above- on its own, makes for a nice start to the day. Choripan is a conflation of the words chorizo (sausage) and pan (bread). One of the most popular chorizos in Lima is what is called chorizo parrillero, a sausage meant for grilling. In the evenings, as workers start heading home as the night's chill starts to set in, shops and entrepreneurs throughout the city pull out carts equipped with propane grills, and commuters line up to purchase warm choripan sandwiches on the way to their bus stops. A butifarra is perhaps the definitive, old-school Lima sandwich. Sold at eateries and from carts all over the city, it -like so many other Peruvian sandwiches- is deceptively simple: slices of jamon del pais (a typical style of ham), with salsa criolla, and -sometimes- a lettuce leaf. That's it. Everything rides on the quality of the jamon and the bread. 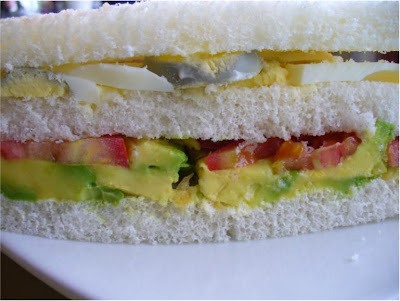 This is another, albeit modern, classic sandwich, consisting of layers of avocado, fresh tomato slices, sliced hard-cooked egg, and a bit of mayonnaise, in between three pieces of white bread with the crusts removed. Hence, it's triple name: three fillings in three slices of bread. Simplicity itself, and great for a light lunch! At Bodega Nishida, on the third block of Burgos street, in San Isidro, they serve a unique and delicious sandwich of glazed pork (lechon glaceado). The pork is slowly cooked with cognac, pisco, red wine, honey, sugar, and aji colorado. Well worth searching out if you are in the neighborhood of the old Clinica Italiana. A recent invention, this sandwich is part of the menu at the Peruvian burger chain, Bembos. Bembos' signature is its selection of burgers with "national flavors". They thus have a "Hawaiian" burger (with pineapple), a "German" one (with Sauerkraut), and so on. The most interesting are the "Peruvian flavor" burgers, in which various criollo dishes are emulated. In this case, it's the classic hole-in-the-wall dish bistec a lo pobre. Bistec a lo pobre -literally 'poorman's-style beef steak'- is a value meal in itself, consisting of a thin-pounded steak, topped with a fried egg, and accompanied by french fried potatoes, fried plantain, tomatoes, onions, and white rice. In this instance, Bembos has combined those elements (sans the rice) into a tasty meal one can hold in one hand, and offered a fun and interesting diversion from the world of run-of-the-mill burgers. Man makes me hungry. Makes me want to go back now.